The energy companies again shoot themselves in the foot with a no show by chief executives at the Commons Energy and Climate Change Committee. Only two of the “Big Six” chief executives appeared before the committee in person. The other four sent lower-ranking executives to answer questions. The strength of Scottish customer concern was highlighted by one of the subs, Neil Clitheroe, head of retail and generation at ScottishPower. He revealed that 60,000 customers called the company with concerns “virtually straight away” when the firm announced its 8.6 per cent increase in bills last week. The companies, with support from the Prime Minister, have used Green levies as a smokescreen for rises. But as Philip Pearson at the TUC points out, there is some £9bn in taxpayer and consumer subsidies and less than a third goes to low carbon energy support. Fossil fuel, gas and nuclear gets the rest. Their other defence is wholesale price increases. 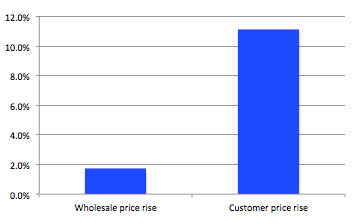 However, as this chart (Labour List) shows, there was a 1.7% increase in wholesale prices as against an 11.1% consumer cost hike. The one cost companies have been good at cutting is their own tax bill. The Independent on Sunday exposed Scotia Gas, half owned by SSE, that runs Scotland’s gas networks. They have used a tax loophole to avoid £72m in tax. In response to this news Ed Miliband said, “On top of failing to address the broken energy market, David Cameron is failing to stamp out tax avoidance. We have a prime minister unwilling to take the side of hard-working people. Unwilling to act against the energy companies, unwilling to clamp down on tax avoidance and close down tax loopholes." If that isn’t enough, a whistleblower at British Gas revealed to the Guardian that the company is siphoning off £20m of extra profits annually, by keeping hold of money owed to former customers who have built up credit on their accounts. Whether it’s a Swiss based tax exile at Grangemouth, or the ‘Big 6’ energy companies – it’s they who are holding Britain to ransom. It’s time to put the ‘public’ back into monopolistic services, and what’s more, the polls show the public agrees. The Sunday Times has a good article today (Money 27 October) on pension liberation scams. I have previously highlighted this problem in our Scottish Pensions Bulletin, but it is worth repeating. Not least because I have personally had two approaches in recent weeks, and while I spotted the scam, others may not have my pensions knowledge. Pension liberation scams are playing on many folks current financial problems with wages not keeping up with prices. In these circumstances people are looking at any means of freeing up cash rather than get into further debt. Pension funds seem like a good idea when you are approached by these cowboy firms. Auto-enrolment is likely to add to the numbers open to this scam that has already attracted £420m from workers pensions. The scam works by persuading savers to transfer their pension in return for a permanent loan that appears to get around tax rules that prevent access to funds before the Minimum Pension Age of 55. What they are not told is that they face a 40% unauthorised transaction charge, rising to 55% if they liquidate more than a quarter of the pension pot. When you add 30% commission, it leaves a paltry 15% for the worker. Astonishingly, much of the scam mechanisms are not actually illegal. The government needs to take urgent regulatory action to safeguard consumers. A 'toxic cocktail' of staffing cuts and violence against public service workers has resulted in another increase in violent incidents across Scottish councils and NHS Scotland. I am at Stirling University today presenting UNISON Scotland's annual survey of violent incidents to UNISON's health and safety conference. 33,689 incidents were reported to public service employers last year - almost 14,000 more than when the first survey was first conducted in 2006. In simple terms, the biggest increase in violent incidents is happening in those services that have suffered staffing cuts. This statistical correlation is backed up by feedback from members who highlight too few staff to deliver on the risk assessments that have been undertaken. A particular concern is the impact of welfare reform. Our members are having to ask some very intrusive questions of service users who are at the sharp end of benefit cuts and other service reductions. It is sadly inevitable that verbal abuse will increasingly turn violent. The politicians who pass these evil laws are not having to face the consequences of their decisions. It is public service workers are the front line. Workers are stretched too thinly, dealing with the public who are coping with cuts in the services they rely on. I am pleased to say that there has been some improvement in recording, particularly in the NHS, but some councils couldn’t even produce statistics. If they can’t produce decent statistics they cannot be monitoring, let alone tackling the problem. There are also positive indications that a number of public bodies are preparing for further problems when the full impact of welfare reform happens. There is very clear guidance for councils on how to address this issue in Managing Occupational Violence in the Workplace (2010). NHS Scotland has similar PIN polices. Convictions under the Emergency Workers Act have increased again last year by 32 to 355. Due to the limited scope of the Act few violent incidents result in criminal action. Sadly, efforts to address this were blocked by the Scottish Government when they opposed Hugh Henry MSP’s, Protection of Worker’s Bill. The UK Government has also undermined protection for workers with cuts to the Criminal Injury Compensation scheme. The Scottish Conservatives recently published the outcome of their FoI survey of assaults on emergency workers. While we welcome their interest, we could have done with their support in changing the legislation! Not to mention their government cuts that are adding to the problems of our members. Behind every violent incident is a personal tragedy for the worker concerned. Often short term physical injury and longer term psychological damage. No one should have to work under the fear of assault. Another by product of austerity economics is the squeeze on savings for a pension. That is bad news for workers and a potentially massive burden on public services. The annual Scottish Widows Women and Pensions Report highlighted a further drop in the amount workers are able to put aside for their pensions. In particular, the number of women saving adequately for their retirement has reached an all-time low, with just four in 10 UK women putting enough away in their pension pot - typically £1000 less per year than men. Women are on average putting £2184 away per year into a pension pot while men are saving £3120. Older women are also more likely to be relying on their partner’s pensions and suffer in pension terms from career breaks. In the Scottish Local Government Pension Scheme (LGPS) women receive an average pension that is only half that of men (£3.5k compared to £7k), despite having similar average pensionable pay. The report urged politicians and the industry to "work harder" to understand the obstacles to building a retirement pot faced by women, who are often forced to prioritise more immediate family needs over long- term saving. While the focus of this report is women, men are not in a much better position. In the last few years of austerity economics less income is being squeezed, so that workers simply don't have the surplus income to put into a pension pot. In addition the loss of quality defined benefit pension schemes means more workers are relying on poor quality schemes with high costs that deliver poor returns on investment. With a high proportion of women workers, maintaining the quality of public sector pension schemes is particularly important. Early indications are that auto-enrolment is working by getting more women, particularly older and part-time workers into the schemes. In the Scottish LGPS our audit shows that even before auto-enrolment women were entering the scheme at a higher level than you might expect given the preponderance of part-time working. The overall gender split is 72% female to 28% male. In terms of membership of the Scottish LGPS, 26% of female members are not in the scheme compared with 21% of men. The difference is not as great as might be expected given the much larger proportion of part-time female members. For example, 40% of women not in the scheme work less than 10 hours. There is also a rough correlation between men and women in the scheme by age. The most significant outlier is actually young men aged 21-30 who are less likely to be in the scheme. It would appear young women are more sensible. These issues have been important considerations in the negotiations over a new Scottish LGPS. Members should by now have received their ballot papers and an explanatory leaflet explaining how we have focused on keeping contributions stable, to keep as many members as possible in the scheme at this difficult time. However, the real challenge is getting the quarter of the local government workforce into the pension scheme, along with many more in the wider workforce as highlighted by today’s report. That requires governments to understand that workers can only save for a pension if they have disposable income – and that means proper pay rises. Without that the demographic time bomb will explode with a vengeance. 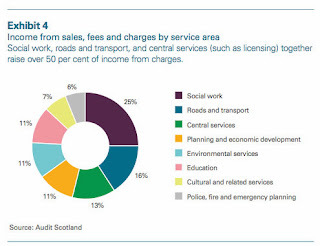 Nearly £11bn of public money is spent each year in Scotland buying goods and services. That’s a lot of purchasing power. Government and public bodies should be using this power as an opportunity to help create a fairer Scotland. That’s fine as far as it goes, but procurement can do much more than ensure legal obligations are complied with – that should be taken as read. UNISON has joined a broad coalition of civil society organisations (STUC, SCCS, SCVO and others) who have identified ten priorities for the Bill. Let’s take the procurement of social care as just one example. Over £400m is spent by councils alone on home care in Scotland, mostly in the private and voluntary sector. Increasing demand for services and declining local authority budgets means these services are being squeezed. The consequences are little short of a national disgrace. Home care workers, often paid little above the National Minimum Wage, employed on zero or nominal hour contracts are literally running around our communities trying to look after some of the most vulnerable members of society. Much has been written about the 15 minute care visit. However, as one care worker said to me recently, “15minutes - that’s a luxury!” They describe a typical day as constantly trying to catch up from too many visits with inadequate travelling time, that some are not even paid for. The only way to finish the day is to cut corners in what are already inadequate care packages. The days when staff could spend some quality time with clients, looking beyond basic care needs, have long gone. Added to this is the growth of personalisation. While fine in principle, in practice it is leading to the loss of socialisation, with day centre closures leaving people isolated in their own homes. This is no way to treat elderly people. We should specify, through procurement, decent employment standards, including the Scottish Living Wage, with no zero-hours contracts and proper training programmes. The aim should be to develop a workforce that delivers continuity of care, not workers who are desperate to find another job. Person centered procurement recognises that procuring pens, pencils and paper should be an entirely different process to buying people services such as social care. The race to the cheapest is rarely the best approach and especially when we are procuring services for the most vulnerable in our communities. Better employment standards not only drive up the quality of service, but are also good for the economy. Paying the Scottish Living Wage means the taxpayer is not subsidising bad employers through the benefit system. Workers with decent wages and secure contracts will have the confidence to buy goods and services that create sustainable economic growth. Studies show that firms that pay the living wage have lower absenteeism, greater commitment and continuity of the workforce. This is how to really, ‘make work pay’. Procurement should be used as part of stronger efforts to tackle tax dodging and tax avoidance, both at home and in developing countries. This could bring in much-needed billions of pounds for the public purse. It is entirely wrong that companies seeking to avoid paying their fair share of tax should be awarded public contracts. The same applies to fair trade. Ethical and responsible trading policies have the potential to transform lives around the world. The opportunity to sell products for a fair price and to work in safe and decent conditions could help millions work their way out of poverty. The Procurement Bill should help Scotland cement its status as a Fair Trade Nation and to lead the way in ethical procurement. Scotland has some of the most challenging climate change targets in the world and the legislation includes a duty upon all public bodies to contribute to meeting these emissions targets. Those companies supplying the public sector should be able to show that they are contributing to a more sustainable Scotland. They can do this by publishing an annual assessment of their carbon emissions and providing information on the carbon emissions attributable to the whole life of goods and services supplied. Public procurement, particularly at a time of financial constraints, has the potential to do much more than just deliver goods and services. If we place sustainable and ethical considerations at the heart of the procurement process, it could promote positive social outcomes for us all. Challenge Poverty Week is an opportunity to highlight the extent of poverty in Scotland and to build support for further action. The Trussell Trust has revealed today that five times more Scots are turning to food banks for emergency aid than last year. Between April and September, 23,073 people were referred to the Trussell Trust for three days’ worth of food – comprising 16,465 adults and 6,608 children. That compares with 4,021 people in the same months of 2012 – 2,786 adults and 1,235 children. The Scottish figures are significantly higher than in the UK as a whole. The long term picture is no better. A study by SCVO showed that one in four Scots will be living in poverty by the end of the decade if the coalition government forges ahead with “criminal welfare reforms” that draw together a range of benefits into one universal credit. A common myth perpetrated by the UK Government is that welfare is for skivers. In fact the biggest element of social security expenditure (42%) goes to pensioners. Then housing benefit is next, accounting for 20%, of whom one-fifth are in work. Then 15% goes on children, through child benefit and child tax credit. Some 8% goes on disability living allowance, 4% on income support mainly for single parents and carers, 4% on employment and support allowance to those who can’t work due to sickness or disability, and 2% on carer’s allowance and maternity pay. Just 3% is spent on jobseeker’s allowance. So if we achieve only one thing this week, let's remember that poverty demeans us all and it doesn't have to happen in a rich country like ours. And if you don't like the moral argument, accept the economic case. More equal societies do better on every measure, so pure self interest should drive you to challenge poverty. I was giving evidence to the Scottish Parliament Local Government Committee today on the draft Scottish Government budget for the next financial year. Our key concern is that local government is bearing the brunt of the UK government cuts in Scotland. £637m since 2008/9 and as a consequence over 30,000 jobs have been lost. This is having a significant impact on jobs, services and in particular, the living standards of council and voluntary sector staff through job losses and cuts to pay and conditions. The General Resource Grant to councils is being cut from £7.189m this year to £6.971m next year and £6.809m the year after. In real terms the cut is even larger - £6.841m and £6.564m. We also highlight the shift from revenue to capital spend and the potential equalities considerations that don't appear in any government budget assessment. The limited budget also comes with strings, the new form of ring fencing that was supposed to be abolished under this administration. Teacher numbers, small business bonus, and until this year, the absurd police officer target that has led to police officers being taken off the beat to substitute for police civilians at twice the cost. Another string is the joint working and community planning agreement. Most of this is fine, but joint working will always struggle while the partners have different accountability mechanisms. The Christie Commission identified this as an issue, but little has been done to address it. The biggest constraint is the regressive Council Tax freeze the cost of which has now topped £2.5bn. This is a huge sum of money that councils can ill afford to lose. We simply have to try and get a cross party agreement on local taxation, to break the policy logjam. Not just for financial reasons, but to return a degree of local democratic accountability to councils. 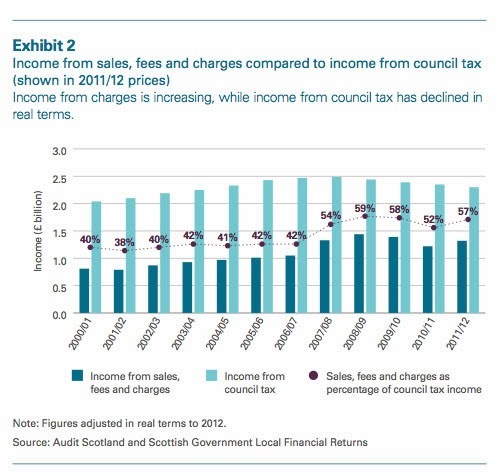 We also highlight the significant increase in charges that many councils are leaving to plug the gaps caused by the Council Tax freeze and other revenue reductions. Again, these are largely regressive; hitting those who need council services the most. Most of the parliamentary committees this budget round are looking at the National Performance Framework – Scotland Performs. This was launched with high expectations that haven't been met. The data is often out of date and the format is not user friendly. There is no clear link between the Scottish Government Budget, its programme and Scotland Performs, neither physically as a web link on the site or in the discussion sections of the site. We would also like to see a move towards including the Oxfam Human Kind index in the performance framework. Finally, we yet again draw attention to the outstanding equal pay cases. Despite helpful recommendations in the past by the Local Government Committee, progress remains slow with councils spending huge amounts of money on legal technicalities – challenges that they almost always lose. We need to move away from a compensation culture and towards an equality culture. One of my favourite books as a social sciences student was Darrell Huff's slim volume, 'How to Lie with Statistics'. It gave me a healthy scepticism of all statistics, particularly when used in support of a particular campaign. My favourite example was Harvard University claiming huge numbers of millionaire alumni based on an annual survey. As Huff points out, it may well be that those who hadn't made a fortune might be somewhat less enthusiastic about completing the survey! The UK Statistics Authority has published a compendium of statistics for use in the independence referendum campaign. Putting my scepticism to one side, the intelligent use of statistics is an essential element of modern debate. While the UK Statistics Authority is neutral on the substantive question of independence, they do care about the safe and effective use of official statistics in public debate. As they put it, "If those statistics are misrepresented or misinterpreted, not only does that lessen the integrity of the debate, it undermines confidence in the statistical system; and that in turn undermines confidence in the vast range of economic and social policies shaped by the statistics." The paper does give some useful health warnings over the use of comparative statistics. While statistical comparisons between administrations can be valuable, they can also be problematic and uncertain. This is particularly true since devolution as public policy in Scotland increasingly diverts from that in England. Official statistics are only best estimates and are not always available on a consistent or comparable basis. Despite these qualifications, this is a very useful compendium. Not just for the referendum debate, but also for wider public policy purposes. However, it would be very optimistic to assume that it will necessarily persuade either side not to follow some the statistical tricks highlighted in Huff's book. Peter Jones in the Scotsman and Magnus Gardham in the Herald are perhaps both being optimistic in their analysis today. Do unlike political hacks! What is more certain is that Andrew Dilnott and the Statistics Authority may well feel free to intervene in future debate, having given this warning shot to both sides. Public ownership is back in fashion after the market failures of rip off Britain. The left needs to tap into this trend to offer diverse delivery models suitable for the 21st century. I was speaking at conference yesterday on public ownership. Fairly esoteric for a Sunday you might think, but actually much more mainstream politically these days. A UK public opinion poll for YouGov showed 61% in favour of common ownership of energy and only 26% against. There has been similar support for bringing the railways back into public ownership and against the privatisation of Royal Mail. This shows the public are way ahead of the policy makers, at least in part because they are fed up with the way many formerly nationalised industries are ripping us off. The need for a debate about ownership in the Scottish economy. The workforce impact including pay, pensions and safety. Contractors cutting corners with safety and service. The failure of regulation with fines simply increasing charges to customers. Promised investment not being delivered as in the rail and energy industry. The environmental impact including the loss of freight to rail. Looking forward speakers and workshop participants focused on what type of renationalisation we should support. This should include new forms of public ownership that doesn't simply create new managerial elites and involves new forms of cooperative and democratic community ownership. I was asked to focus on water and energy. Water is the easy one as it remains a public service in Scotland, despite well funded privatisation campaigns supported by the multi-national water companies, the Water Industry Commission and more recently the Scottish Futures Trust. When they didn't work other mechanisms were suggested including mutualisation and public interest companies. In the capital intensive water industry these would all lead to privatisation by the back door. I would recommend Tommy Kane's chapter in the 'Red Paper on Scotland 2014' if you want to understand more about the efforts to privatise Scotland's greatest asset. Scottish Water also offers some lessons about public ownership. Managers constantly talk about the 'company' and the regulatory framework apes the English privatised structure. Instead we should be democratising Scottish Water as set out in the STUC publication, 'It's Scotland's Water'. The recent row over Ed Milband's price freeze highlights the importance of moving the main political parties away from failed market mechanisms. Fergus Ewing was also very quick to parrot the energy company briefing in last week's Holyrood exchanges. Scotland’s energy trade unions have long argued for a planned energy policy that provides safe, secure and sustainable generation, which contributes to the economic future of Scotland and eliminates fuel poverty. While supporting the development of renewable energy, trade unions argue for a more balanced energy policy that will ensure that Scotland is not reliant on a few energy sources. • A strong political vision over the long term, with commensurate policy and planning provisions. • Favourable feed-in tariffs to create the incentive for new generation using different business models. • A state owned grid that will usually connect up communities. The cost is repaid through a public service obligation payment in energy bills. • A clear focus on energy efficiency with measures to tackle hard-to-heat homes. • Strengthening the ability and willingness of local government to get involved - a utilities culture largely lost in the UK. Smaller local authorities to support real communities of place might also help. The Reid Foundation energy paper published over the weekend picks up on some similar themes. I might disagree with their conclusions about what you might do with a different Scottish energy policy, but the focus on moving away from the failed faux market mechanisms and introducing new forms of public ownership, is clearly right. A new focus on public ownership is the right response to the failure of privatisation. We now need to develop the practical delivery solutions that taps into renewed public support. Short-term stabilisation funds provide a mechanism to buffer the budget from year on year variations in oil and gas tax revenues. They entail saving a proportion of tax receipts in a fund during years when receipts are higher than expected, and withdrawing from the fund in years where receipts are low. They therefore provide a liquid source of funding to help protect the budget, and in turn the provision of public services, from fluctuations in oil and gas tax revenues. Long-term savings funds allow countries to save a proportion of the tax revenue generated from oil and gas production for future generations. By doing so, a savings fund enables the returns from finite oil and gas revenues to be converted into a permanent pool of financial wealth that will generate income flows from interest payments, dividends and rising asset values. If carefully managed these revenue streams can lead to a permanent source of income that can be utilised long after oil and gas production has stopped. Such funds are common among oil and gas producing countries. Of the 20 largest oil producers in the world, the vast majority operate some form of national or sub-national Sovereign Wealth Fund, with the UK being a notable exception. Norway provides a good example of how a country can effectively manage its oil and gas revenues and the report argues that their experience offers a number of important lessons for Scotland. While the debate on the financial consequences of independence goes on, most objective commentators accept that Scotland's revenues would be greater immediately after independence, if you take into account a geographical share of UK oil. However, the problem with oil revenues is that they are both price volatile and finite. In this context, it seems a perfectly reasonable proposal to establish a stabilisation fund to balance the books from good oil price years to bad ones. Of course, in the current state of the public finances there isn't a surplus to pay into the fund. The second proposal is more problematic. In principle an oil fund is an excellent idea as the Norwegian experience shows. The UK should have established one rather than Thatcher squandering the resource on unemployment in the eighties. However, as the Fiscal Commission report concedes, it is unlikely that any Scottish Government will be in a position to contribute revenues to the fund for a number of years at best. By the time the inherited deficit is at a manageable levels, it is unlikely that there will be much of a surplus. The notion that we will be in a position to contribute to such a fund in 2017/18 seems highly optimistic. The report also states that, "The ultimate aim for a long-term savings fund should be for Scotland to run some form of onshore budget balance". The financial consequences of this for public services are far from positive in all but the most optimistic fiscal scenarios. So in summary, the stabilisation fund is a solid proposal, but the longer term oil fund is only practical in the most optimistic view of post-independence financial scenarios.